Last Wednesday was a sweltering 94 degree high humidity day. I had an appointment in the area and couldn't help checking out a favorite site; the Dave Elliot bed on Route 209 just west of Kingston, NY. The bed is highly fossiliferous silty sandstone, just a few inches thick in an exposure that's 30 to 40 feet high. The bed is Middle Devonian age with tiny bivalves and cephalopods dominant. I spent a total of three hours chipping away hunks of rock from the crumbly cliff and had my best day there so far: seven complete or nearly complete goniatite ammonoids, Tornoceras mesopleuron. a three and a half inch nearly complete straight-shelled nautiloid, Michelinoceras sp. ?, five Eumetabolotoechia brachiopods (normally I just find one or two per day), a tiny spiriferoid brachiopod (unidentified) I've never found at this site before, bivalves, Nuculites sp. 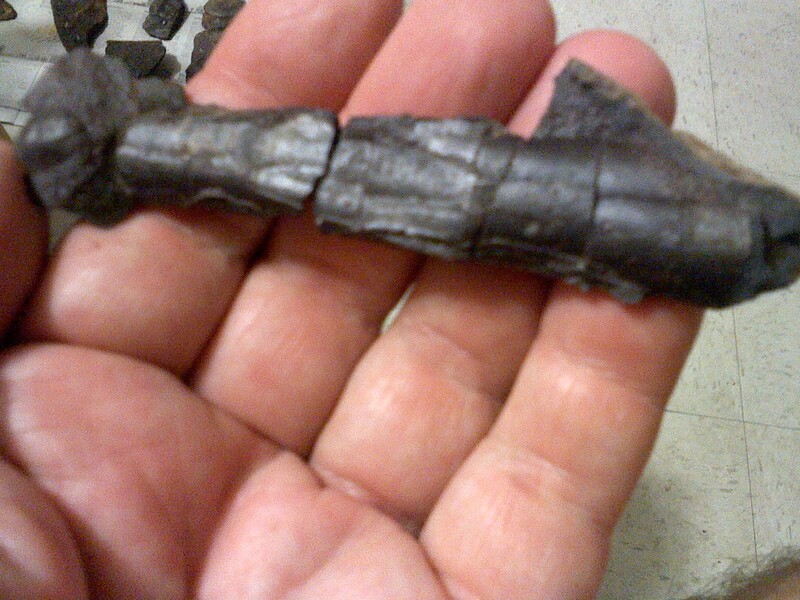 ?, the twig of a fossil plant, and two other unidentified fossils. The day was well worth it, despite the heat. The unidentified fossils I'll show Dr. Bartholomew, professor of paleontology and stratigraphy at the State University near where I live. Dr. Bartholomew is doing an extensive study of the Dave Elliot Bed in eastern New York. The Dave Elliot fauna here in Kingston is similar to the fossils from Hannacroix Ravine except that brachiopods are rarer at Hannacroix. The presence of well preserved fossil plants in marine sediments would suggest the presence of a nearby river that carried their remains from some terrestrial habitat. The absence of corals and relatively low species diversity also suggests the water contained a large ammount of sediment making it hospitable to only those creatures who could adapt to this cloudy environment. Finding fossils, especially cephalopods, and speculating on what the prehistoric environment was like is a great source of fascination for me. I try to get there whenever I have a chance. Less than a mile north of here, also on Route 209 is another even older Middle Devonian fossil bed that produces abundant spiriferoid brachiopods and rugose corals, and about a mile and half west is a site where spirifers and occasional bivales and cephalopods can be found. I no doubt speak for many when I express admiration of your studying the whole fossil assemblage of a discrete horizon, and then postulating theories regarding the paleoecology by why some things are there, and other things aren't. Having searched though some of those areas myself, I am also quite impressed at your perseverance. The Middle Devonian along the Catskill Front can be rather spotty. The Tornoceras alone would make it worth the effort for me. You may be interested to know that Hannacroix Ravine in Albany County is the northernmost exposure of the Dave Elliot bed and the Kingston site is the southernmost exposure. There are a number of sites (7) between which, according to Dr Batholomew, have different faunal elements; dominated by brachiopods with occasional corals and crinoids present. Cephalopods and plants are not present. This suggests different conditions at those other sites, perhaps clearer water, and the proximity of rivers and similar conditions at both the Kingston and Hannacroix Ravine sites. For me fossils are more than objects and when taken in context of where they are found they tell fascinating stories about life and conditions in these paleoenvironments. Just to update: I've returned to the site twice since that "hot" day. I also met with Dr. Bartholomew and showed him my finds. 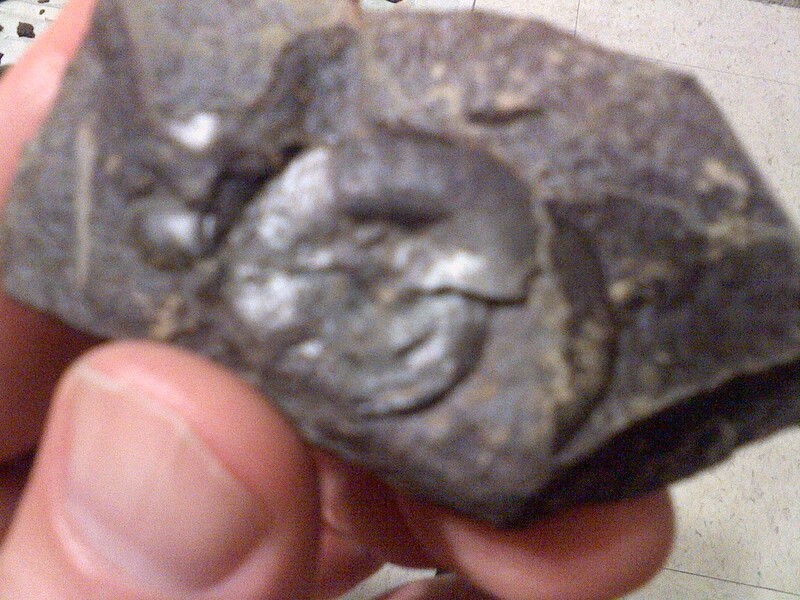 I've found more complete goniatites, straight-shelled nautiloids including one three inch bulbous speciman that Dr. Bartholomew identified in Index Fossils of North America and was the first he's seen like it from that locality. Unfortunately I forgot to write down the name. He was even more excited about a conularid which he says are quite rare and which he's also never seen from that site. In addition a small piece of scaly lycopod bark was found. Dr. Bartholomew believes that the Route 209 site in Kingston and Hannacroix Ravine were both deep water sites while the other Dave Elliot Bed sites between were more near shore environments. He drew a picture showing the reconstructed coastline bulging westward like a river delta with the Kingston site just south of it and Hannacroix Ravine just north. Hope to continue visiting this productive site. Sounds like some productive outings for you Jeff. Congratulations on the two "firsts" from the site.